Athelstan Lodge, from 1865 to its merger with Montacute Lodge in 2003. Guiding Lights Lodge, from 2003 to the present. Isaiah Thomas Lodge, from 1920 to its merger with Morning Star Lodge in 1974. Level Lodge, from 1952 to the present. Montacute Lodge, from 1858 to its merger with Athelstan Lodge in 2003. Morning Star Lodge, from 1793 to 1839, and from 1844 to the present. Quinsigamond Lodge, from 1870 to the present. Rose of Sharon Lodge, from 1927 to its merger with Morning Star Lodge in 1974. 01/21/1857: VI-158; Dedication of Masonic Hall, reported in the Grand Master's Address at the Feast of St. John. 06/16/1867: Hall Dedication; not in Proceedings; see below. 09/12/1913: 1913-164; Corner-stone laying, at a Special Communication. 09/03/1914: 1914-192; Hall dedication, at a Special Communication. NEW MASONIC HALL AT WORCESTER. The Brethren at Worcester having recently fitted up in the new Post-office Building, in that city, a series of elegant halls for their accommodation. The same were dedicated by the M.W. Grand Lodge, on Tuesday, the 16th ult. The arrangements for the same were made on a liberal scale, and were carried out fully. Notwithstanding the unfavorable state of the weather, the Brethren did not allow it to dampen their ardor ; and their reception of the officers of the M.W. Grand Lodge, who were present with the jewels all filled, was of the warmest and most gratifying character. The greatest interest was manifested by the Brethren of Worcester and neighborhood, and the occasion passed off in a manner which will cause it to be remembered with pleasure by all who participated in it. The perfect adaptation of the building to the wants of the various Orders in Worcester, particularly the Prelate's room, and the arrangements for the convenience of the Knights Templars and the Lodges, met with the hearty approval of the officers of the Grand Lodge who were called to inspect them; and we cannot but congratulate the Brethren of Morning Star, Montacute, and Athelstan Lodges that they are now in possession of apartments every way fitted for their use; and may their beauty and perfect arrangements stimulate all to renewed efforts in exemplifying the beauty of our principles, and their perfect adaptation to the moral wants and the kindly sympathies of the human heart! The services of dedication commenced at 8 o'clock, p.m. The room was filled with the members and their ladies, and the parent Lodge must have felt a glowing exultation in the contemplation of the youthful bloom and vigor of her two fair daughters. At the conclusion of the impressive ceremonies of dedication, the company repaired to the banquet-hall; and, after blessing had been asked by Rev. Brother Stratton, full justice was done to the bountiful entertainment provided for the guests, consisting of the choicest fruits of the season, and all necessary accompaniments. Addresses and sentiments cheered the house; and, on separating, every heart beat in unison with the warmest wishes for the continued harmony and happiness of the Brethren of Worcester. The Masons of Worcester, Mass., are to erect a $125,000 Masonic Temple which they expect to have ready for occupancy by September 1st. The building will be three stories high. It will have a frontage of 270 feet and be 125 feet deep and will be one of the finest in the country. The first floor of the temple will be devoted to social rooms, reading room, card and billiard room, library, reception hall, parlor, coatroom, committee rooms and an office for the custodian of the building. The second floor of the building will be given over to two large lodge-rooms, 64 feet by 40 feet, which will be known as the blue lodge-room and the red lodge-room, the latter for the higher branches of the order. 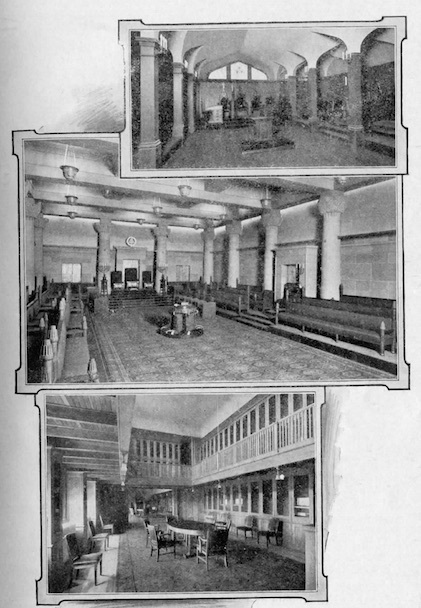 Upon the third floor of the temple will be two more large lodge-rooms, which will be used only by the Worcester county Commandery, Knights Templars; the chapter bodies and the Scottish rites bodies, the lodge of Perfection, Rose Croix Chapter, Princes of Jerusalem, the latter comprising degrees up to and including the 18th. The intermediate lodge-room is to be separate from the other and will include all necessary connections for the work of the fraternity. In the basement of the building will be a banquet hall, kitchen and serving room attached; storage room and the engine and boiler room, along with a specially constructed machinery room for the ventilating of the entire building. Electricity will be used throughout the new temple for lighting purposes as well as for power to run two passenger elevators from the basement floor, while another feature of the new temple will be two mezzanine or intermediate stories or galleries between the first, second and third floors of the building, which will be devoted to small lodge-rooms. 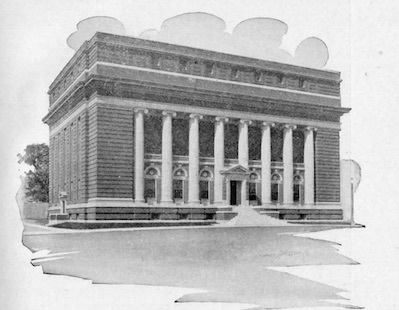 For over two years committees of the Worcester Masonic Charity and Educational Association have been at work on the plans of the new temple now in course of construction, and when the contract for the foundation was awarded their conclusions resulted in plans for a Masonic Temple which will when completed be a credit to the fraternity of Worcester and even the state of Massachusetts. No circumstance in the history of Freemasonry in the city of Worcester has more deeply interested the members of the fraternity than the dedication of the new and magnificent Masonic Temple which took place Thursday, September 3, 1914. The event was the culmination of plans that have been long maturing. The Masonic bodies had outgrown the capacity of the old quarters,— more room and better conveniences were desired. In the February, 1912 issue of the New England Craftsman we stated that the Masons of Worcester proposed to erect a Masonic Temple at a cost of $125,000. A description of the building was then given. The plan then announced has matured in the beautiful Temple just dedicated. The exercises connected with the dedication covered the day and evening. 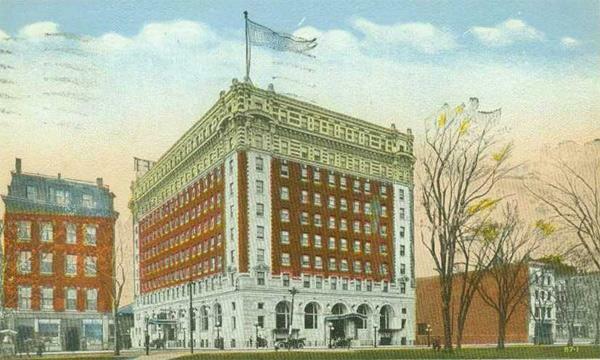 They included a parade in the morning, dedication in the afternoon and banquet in the evening, held at the Bancroft Hotel. The officers of the Grand Lodge reached Worcester shortly after ten o'clock and were met by the reception committee and conveyed to the Masonic Temple in automobiles. The grand officers present included Grand Master Melvin M. Johnson, Senior Warden Chauncy E. Peck, Junior Warden Charles S. Proctor, Recording Grand Secretary Thomas W. Davis, Past Grand Masters John A. Blake and Everett C. Benton, Deputy Grand Master Emery B. Gibbs, District Deputy Grand Masters Harry G. Pollard, Albert N. Ellis, John A. Coburn, John G. Prouty, Austin A. Heath; Grand Stewards, Henry B. Prescott, and Percy W. Carver; Grand Tyler George W. Chester and Grand Marshal William M. Farrington; Acting Chaplain Rev. John C. Breaker, Senior Grand Deacon Gurdon W. Gordon, Grand Pursuivant, Osgood Plummer. Other prominent brethren present as guests of the Grand Lodge or of the Worcester bodies were: W. W. Johnson, grand commander of the Grand Commandery; Edgar W. Evans, head of the Grand Council; Eugene A. Holton, Grand High Priest of the Grand Chapter; Past Deputy Grand Masters William H. Emerson and George W. Bishop, Past Senior Grand Wardens Elias P. Morton, Forrest E. Barker, Frank W. Mead and Harry E. Ballard; Past Junior Grand Wardens William H. H. Soule, Oliver A. Roberts and William L. Belcher. The morning parade attracted much attention. It was in charge of Col. L. P. Rider who is Past Commander of Worcester County Commandery, K. T. His staff was made up of Chief of Police George H. Hill as chief of staff, E. P. Taft, representing Montacute Lodge, A. G. Guy, representing Morning Star Lodge, Harry W. Marsh. representing Quinsigamond Lodge; Capt. W. A. Condy, representing Athelstan Lodge and Capt. E. W.Wheeler of Battery B, representing the Worcester County Commandery. The Worcester County Commandery wore full regalia. In the triangle as guests were George E. Danforth, James L. Beckford, Horace E. Osgooi and J. Howard Gile, members of the St. George Commandery of Nashua, N. H.
The Committee of 33 which is given much of the credit for getting a new home for the Masons of Worcester marched in a body and was given a place of honor in the line of march, following Morning Star Lodge, the oldest lodge in the city. 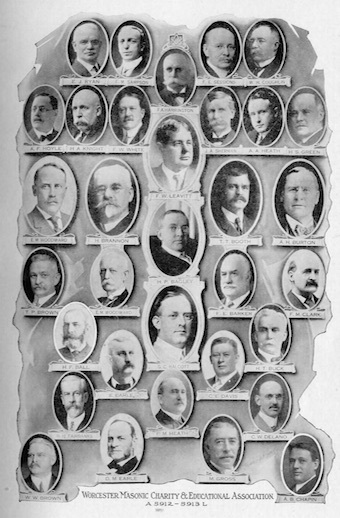 The committee is composed of Fred W. Leavitt, president, H. P. Bagley, George C. Halcott, E. J. Ryan, F. M. Sampson, Frank A. Harrington, Frank E. Sessions, W. H. Coughlin, A. F. Hoyle, H. A. Knight, F. W. White, J. A. Sherman, A. A. Heath, H. S. Green, E. M. Woodward, H. Brannon, T. T. Booth, A. H. Burton, T. P. Brown, F. E. Barker, F. M. Clark, H. F. Ball, E. Earle, C. E. Davis, H. T. Buck, H. H. Fairbanks, F. M. Heath, C. W. Delano, W. W. Brown, B. M. Earle, M. Gross and A. B. Chapin. The parade was in the following order: Platoon of mounted police; Worcester County Commandery; Frank C. Harrington, Commander; Quinsigamond Lodge, Harry C. Young in command; Athelstan Lodge, Dr. Hugh O. Peterson in command; Montacute Lodge, B. W. Underwood in command; Morning Star Lodge, Henry Brannan in command; Committee of 33 which had charge of plans for Temple; automobiles containing officers of the Grand Lodge and guests. On reaching City Hall the grand officers and guests alighted. They reviewed the parade from City Hall Plaza. In addition to the officers and guests there were many prominent city officials including Mayor George M. Wright, the aldermen and heads of the various departments. The procession reached the Temple shortly after twelve o'clock. A buffet lunch was served in the Banquet Hall. The ceremony of dedication was opened in Egyptian Hall at 2 o'clock, the Hall being filled to the limit. The hrst incident was the reception of the Grand Master by Morning Star Lodge, the oldest of the Worcester Lodges. Then followed the dedication ceremony according to the established form. Excellent music was given by he Orpheus Quartet and the new organ was played by the organist of All Saints Church. Too much praise cannot be given to the brethren who actually did the great work of designing and building the Temple. Thoughts are the beginning of every creative things hence we may feel when a great structure has been erected that it is a part of the life of those who have made it,— that with the brick and the iron there is also something of the individuality of each person who has moulded the plans or executed the designs and their names should be preserved as faithfully as the work they have created. This fact has not been forgotten and on either side of the vestibule has been placed heavy bronze tablets on which are inscribed the names of the building committee, trustees of the association and the architect. We are under obligation to the Worcester Magazine, which gives an elaborate description of the Temple with several splendid illustrations, for some facts regarding the work of the architect, Brother George C. Halcott. The Brother is superintendent of public buildings of the city of Worcester and is a recognized leader in his profession. For three years Frank W. Leavitt, president, and Harry Brannon, vice president of Worcester Masonic Charity and Educational Association and Herbert P. Bagley, chairman of the finance and building committee, and other workers met the architect weekly, and often more frequently, to discuss and decide on the plans for the building. Brother Halcott worked earnestly nights, Sundays, holidays and vacations without in any way neglecting his duties to the city, yet no one can say there is a flaw in the Temple. It has few equals of its kind in the world. The architect had strong and defined ideas of what the Temple should be. Upon these he risked his reputation and staked the acceptance of his plans. He believed that within the closed doors of the building, it was possible to do away with the necessity of incorporating Masonic symbols here and there to impress the full meaning of his surroundings on the member. He believed that by employing the proper orders of architecture, color schemes and furniture, that it would be possible to present an interior that would unconsciously impress the Mason that he was fairly within his fraternal sphere. His success in this has been little short of phenomenal for, to the Mason once within the portals, the very walls breathe an atmosphere charged with the secrets of the great fraternity. Only once does a Masonic symbol appear and this single instance on the outside of the building. Here in the Tympanum of the front entrance the pediment contains the familiar arrangement of the Holy Bible. Square and Compass, flanked on either side by conventional designs of acacia, beneath which is the inscription "Fiat Lux,"— Let There Be Light. The structure itself rises seventy feet and consists of three floors and basement. The exterior is pure Ionic. The first floor is given up to social purposes. There is a parlor, library, reading room, ladies reception room, executive committee room, billiard room, card room and various anti-rooms. All these are appropriately and handsomely decorated and furnished. At the rear of the main floor is the grand staircase leading to the second floor. On this floor is the splendid Grecian chamber. On the floor above the Egyptian chamber. In both chambers the organ arrangement is ideal. Light screens have been used as wall partitions part way around the rooms. Behind the screens the organ pipes are extended and the great instruments send out their music in the most unexpected places fairly flooding the chambers with their tone. Other rooms are provided for the Knights Templars, including chapel, Prelate's room and armory The entire building is beautifully ane appropriately decorated and furnished. The exercises of the day closed wit! a grand banquet at the Bancroft Hotel. There was a large company of brethren, many of them among the most prominent of the state. Brothel William E. Brown presided and Brother Fred W. Leavitt was toast-master. Those who spoke were Grant Master Melvin M. Johnson, Mayor Wright and Grand Commander Johnson. Rev. Dr. H. Stiles Bradley, the orator of the day was invited to speak but politely preferred to give his time to the Grand Master, the special guest of the occasion. Grand Master Johnson was cordially welcomed and made the principal address of the evening. All of the speeches were of high order and were received with close and appreciative attention. This page was last modified on 19 September 2015, at 07:37.